Are the Global Goals Famous Yet? At the end of September, the UN agreed the Sustainable Development Goals –a non-binding set of ambitious targets for global progress to be met by 2030. There is widespread agreement that the power of such goals is to help civil society leverage action –and so that making the goals ‘famous’ is key to their success. That was the explicit aim of the Global Goals coalition, which brings together a range of NGOs, foundations and private sector partners. “If the goals are famous- if people care about what has been promised by the politicians, it greatly increases their chance of being implemented” suggests the coalition’s latest press release. Has the effort to make the goals famous laid the foundation for a global movement? The initial evidence suggests ‘not yet.’ And in defense of the Global Goals organizers, that isn’t for lack of trying. Perhaps the problem is with the goals, not the coalition. We’ve seen very successful efforts at raising interest and awareness of development issues before. In 2005, the Make Poverty History campaign on trade, aid and debt relief played a role in motivating G8 policy action. The record of Internet search engine requests suggests the campaign’s reach. Figure One compares search levels over time from Google Trends for “Make Poverty History” relative to the frequency in searches to “Kony 2012” (one of the world’s most successful viral videos) “Taylor Swift” (one of the World’s most successful pop stars) and Malala Yousafzai (searched as “Malala” and probably the world’s largest ‘development’ star). The figure suggests the Make Poverty History campaign equaled interest generated by Malala at peak moments like the award of her Nobel Prize and even approached the lower bound of Swiftian interest. Turning to the SDGs, the Global Goals press release suggests that there was a serious effort made to raise interest at the end of September: in the seven days after they were agreed on 25th, fully 40 percent of the world may have heard about the SDGs. Mobile phone companies sent one billion text messages; 500 million kids were told about the SDGs at school; 700 million people who may have watched news items, content or the Global Citizen Festival (a concert held in Central Park) on television; and 250 million people were reached by 600 station partners in ‘Radio Everyone.’ That effort comes on top of considerable popular participation in the run-up to the SDGs including the millions of people who participated online in the My World online survey. What was the result of this effort? 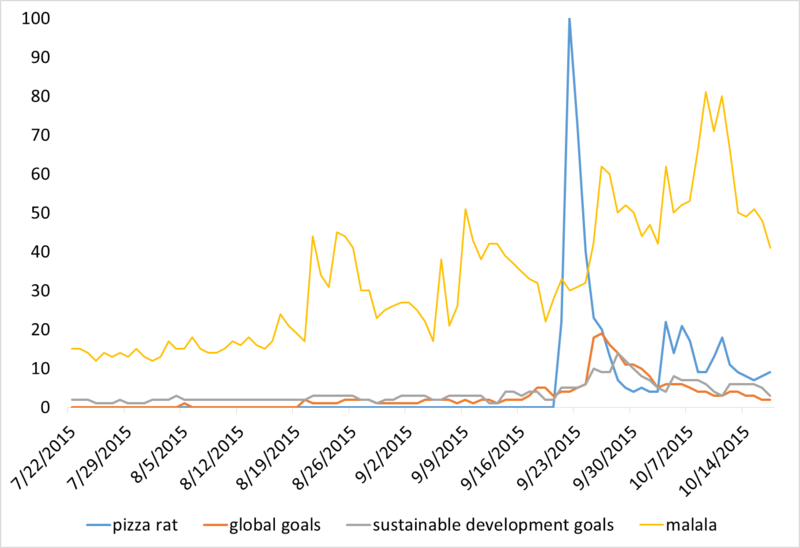 Figure Two compares search intensity for Malala, “pizza rat” (a recent viral video of a rat dragging a slice of pizza down the steps to a New York subway) “global goals” and “sustainable development goals” since July. The results suggest there was a rise in search interest around the SDG signings in late September, but it did not reach ‘minor viral’ status. So far, the Global Goals/SDGs/Sustainable Development Goals have not peaked at a small fraction of the search interest that Make Poverty History sustained for months. Figure Two also suggests a rapid decline in interest since the UN meetings, and some evidence of the road still to go on the Global Goals rebranding exercise (in that ‘Sustainable Development Goals’ is back as the more common search term). Google search terms are only one measure of interest. But analysis using Topsy suggests a rapid dropoff in twitter traffic using the #globalgoals and #SDGs hashtags while the GDELT database of global news sources also suggests stories mentioning the Sustainable Development Goals peaked around the 25th but quickly returned to their level of early September. It is important to note there was a comparative surge of interest across all measures –the events and social media efforts around the UN General Assembly meetings were accompanied by considerably higher interest in the Goals. But that interest (at least on the Internet and in the news) appears to have faded before reaching anywhere near levels associated with Make Poverty History or development stars like Mala Yousafzai. There are still fifteen years for those who want to make the Goals famous, and campaigns experts in organizations like ONE and Project Everyone may have many good ideas about to do that. But one final reason for concern is that the founder of Project Everyone, which spearheaded the Global Goals effort, is Richard Curtis. He was also a founder of the very successful Make Poverty History movement. And that might suggest the early problems with selling the SDGs aren’t so much with the marketers involved, but with the product they are trying to sell.